I need to get bigger backdrops. This one I jury-rigged out of the set I printed out way back when, and it is a bit wierd with all the different colours. Trying to get all the minis from these sets in the same picture was not feasible, and even each set in a single picture did get a bit… crammed. Only goes to show that you get a lot in these games. Seems you get a bit more value for money in this set, with a tad larger minis and 4 more of the lowest level mook. …and yes, I realise should have held the camera at a higher angle to get a better views of all the minis. But I didn’t so here we are. But anyway, I have finished both sets of this game, and that makes somewhat of a landmark for me. Actually finishing something. Pat on the back for me. Oh well, no rest for the wicked. Onwards and upwards! Never mind the photography – cool figures and great paintjobs! 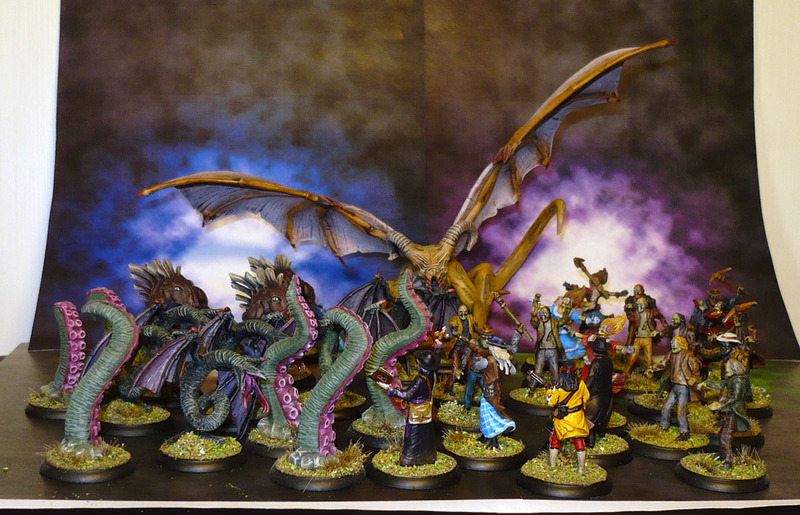 Seeing this is a great advert for the game – well painted minis make you want to play. PreviousShadows of Brimstone: The Harbinger!